Dead-sounding bass strings (wound strings) can be revived, as long as they don’t look like they’ll snap if tension is released. A full maul-to-maul resuscitation is required. Simply identify the culprit, release all tension, grab the eye windings with maul grip, lift off the hitch pin and turn 1-3 full turns in the direction of the winding. This can re-instate an overtone rich sound to a string – and will last for at least several years. 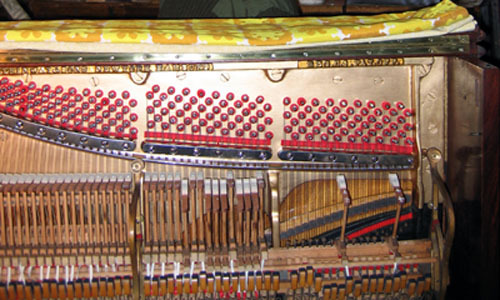 The resulting sound fits in well with the neighbouring strings – which is very preferable to the stark tonal difference of a newly made string (or badly selected string, like a hexacore string fitted into a round core set). This entry was posted in Technical and tagged String reviving. Bookmark the permalink.